1. Form an underbody of 3 layers of lead foil tapering towards the back. 2. Tye in your thread at the eye covering the lead foil ending up at the eye of the hook. 3. Hold a small length of the nylon with a pair of pointed tweezers melting both ends to form the eyes. 4. Attach the eyes using the thread with a figure of eight between each eye. 5. Tye in your scud back on the way round the bend stretching it as you go until you reach the back of the hook. 6. Run your thread back up ready to catch in your yarn which I have wound onto a bobbin as this will make it easier to form the body later in the tying. Wind the thread down the bend tying in the yarn as you go, I like to bring the thread back up and whip finish off as it would only get in the way when forming the body. 7. Now you are ready to form the body, start off with a turn of yarn behind the scud back then one in front, then tye down the scud back with a single turn heading up the body repeat this twice. 8. Once the first two segments have been formed increase the number of turns in front of the scud back to two and again with one turn of yarn in front as this will give you the natural shape which you want in the body. Leave the scud back in place as this will be used for the thorax cover later on in the fly. 9. Prepare a small brown partridge feather by cutting the tip off it to form an equal amount of fibres either side for the legs, tye this on top forcing the fibres down either side. 10. Dub on the brown seals fur tapering towards the eyes. This is the shape that you are looking for when the dubbing is wound down. 11. Tye in the scud back in front of the eyes forming the thorax cover. 12. Tye in the horns at this point with 3 to 4 turns colour the thread with a brown permanent pen as this will help blend the thread into the dressing. Fold the waste end of the horns and the scud back forming the head, cut away the waste. Finally coat the thread with some varnish and whip finish. Use a dubbing needle or a piece of Velcro to bring out some of the fibres at the thorax. 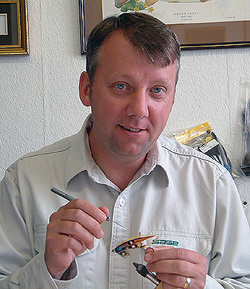 Classed as one of the very best tyers in Europe, Davie McPhail has been tying flies since 1982. Well known for his innovative designs, he worked as a manager at Springwater Fishery, Ayrshire. Over the past few years Davie has gained a fame in the flyfishing world for his youtube videos, who have been view nearly 6 million times. He currently has over 10.000 subscribers to his channel and posts step-by-step videos several times per month. 3. Hold a small length of the nylon with a pair of pointed tweezers melting both ends to form the eyes then attach them using the thread with a figure of eight between each eye. 10. Dub on the brown seals fur tapering towards the eyes. This is the shape that you are looking for when the dubbing is wound down. 12. Tye in the horns at this point with 3 to 4 turns colour the thread with a brown permanent pen as this will help blend the thread into the dressing. Fold the waste end of the horns and the scud back forming the head, cut away the waste. Finally coat the thread with some varnish and whip finish. Use a dubbing needle or a piece of Velcro to bring out some of the fibres at the thorax.